Ship modeler, lead volunteer and club Commodore Paul Reck said he got burned out on his current project, the schooner yacht Mayan. He’s been wrestling with trying to get a a nice weathered look to the model’s teak deck and needed a break. He had acquired a neat little vintage plastic kit from the old Pyro Plastic Corporation and has been working on it lately. The whole model is only about 9-1/2″ long overall and around 1:170 scale according to one website (no scale is given on the box). 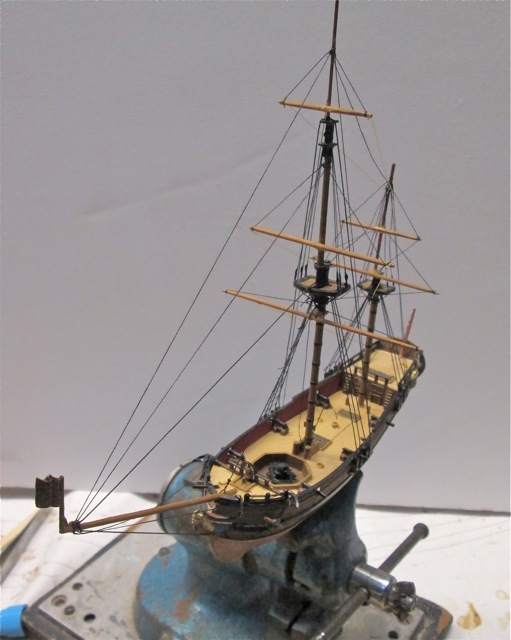 Because the yards were molded as part of the sails, and he didn’t want to put sails on the model, he had to fashion some yardarms from maple. The thin and “bendy” nature of the plastic masts, it took a very careful touch with the rigging to keep everything straight. But, it was difficult to keep lines from getting too slack. Paul also didn’t want to use the pre-molded plastic shrouds and ratlines, so rigging that part was an extra challenge, but he seemed to really enjoy the build. Hopefully, we’ll see the model, in person, at the next meeting. This entry was posted in Club News, News, Paul Reck by catopower. Bookmark the permalink. Sometimes you just need a break. 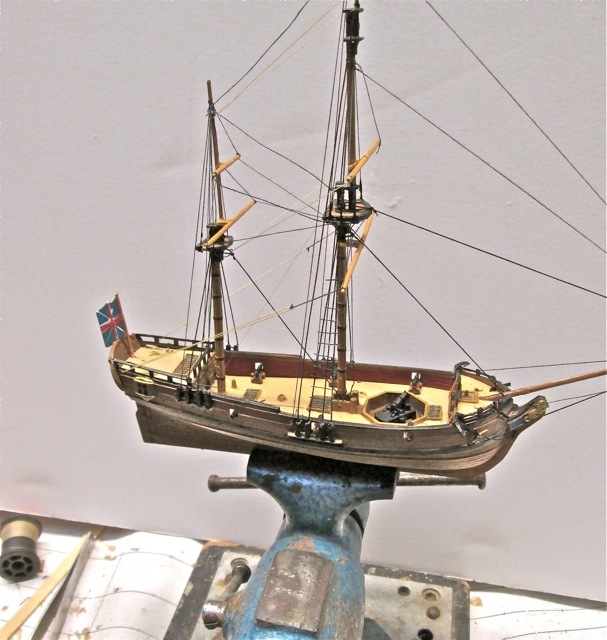 Take a look at ship modeler Paul Reck’s latest side project.